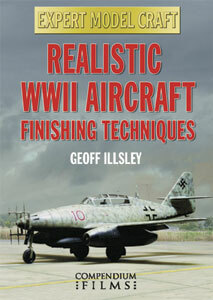 At last, a new series of practical, how-to, DVD's that really show you how to improve and perfect your model making. Internationally recognised experts guide you through modelling techniques that will improve your modelling and help you develop your skills. Each programme will run for 55 minutes PLUS many DVD extras. 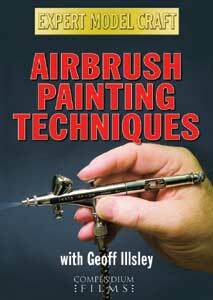 Geoff Illsley is one of the world’s finest airbrush painters. In this program he reveals the secret of his success and in super close-up detail he shows us the essential skills necessary to achieve completely realistic results to award winning standards. In Airbrush Painting Techniques Geoff illustrates the selection, stripping and cleaning of airbrush equipment and shows how to choose, thin and mix paint for airbrush loading. 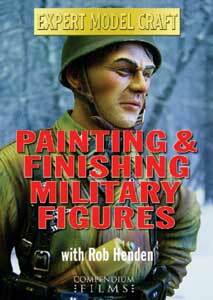 He looks in detail at priming, undercoating and pre-shading and goes on to demonstrate airbrush techniques on faces and figures, aircraft camouflage, surface texturing, metals, wood, materials, feathers and so much more. A highly detailed menu lists each topic for easy and immediate navigation whilst the DVD pause facility allows you to stop the action at any time to appreciate in close detail each step and the finished astonishing models. 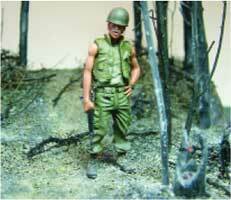 Rob Henden, internationally respected modeler, shows how to choose, assemble and paint military figures. In super close-up detail we learn the skills necessary to achieve the completely realistic results that led to the creation of his Gold Medal winning SS Fallschirmjager figure. This program takes us from research, kit choice and tools required through cleaning of castings, filling and finishing assembly, to priming, brush and airbrush painting and eventually to appropriate base-work. He looks in detail at texturing, painting flesh-tones, facial features, clothing, weapons and equipment, wood grain, leather, dry brushing, metals and much more. The international world of military modelling descends on Folkestone, England for one of the greatest modelling shows on earth. 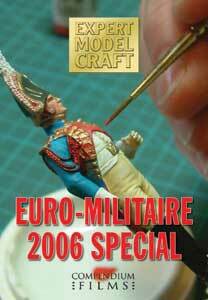 Euro-Militaire 2006 Special welcomes some of the world’s finest practitioners to display and compete with modellers in all categories and levels of the craft, sharing a mutual love and fascination for military modelling. See the judges at work and learn how they tackle their difficult task. Hear master modellers talk about their techniques and above all, see the great array of world-class models on display. This DVD takes you behind the scenes to meet the organisers, the judges and the modellers themselves as they strive to win the most coveted prize of them all .…. 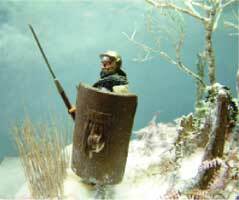 “The Euro-Militaire 2006 Best of Show”. Running time 80 minutes. Including Bonus Extra 12 minute model panorama. 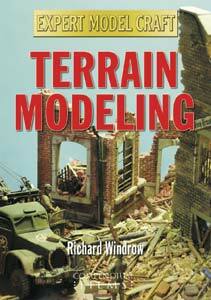 World ranked author and award-winning modeler Richard Windrow is a pioneer in the field of terrain modeling and has invented countless new techniques in his quest to create the perfect setting for models of all types. Frequently undervalued by otherwise excellent craftsmen, the importance of terrain in model presentation cannot be over-estimated. In this programme one of the world’s finest exponents shows us how to model truly realistic landscapes including groundwork, trees, grasses, hedges and vegetation of various types, muddy tracks, rocks, ice and snow and brick strewn urban wreckage. One of the most popular pursuits in military modeling is the recreation of realistic military vehicles and German WW2 armor ranks at the top of the interest list. 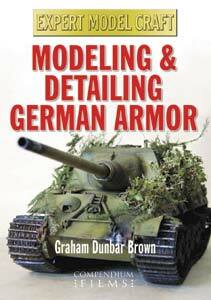 In this Expert Modelcraft programme award-winning modeler Graham Dunbar-Brown demonstrates the skill of building and detailing a Henschel production Jagdtiger tank kit from the box to the finished battle scarred veteran “X2” that surrendered at Iserlohn in April 1945. In high quality close-up detail we see the process of detaching and cleaning the parts, assembling the tools, paints and glues, kit assembly with additional detailing, washing, painting and spraying, texturing and weathering. Thousands of modelers aspire to recreate perfect AFVs complete with those magical final details that exactly replicate the true weathered appearance of the vehicles in active condition. 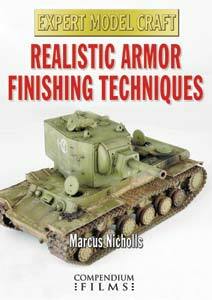 In Realistic Armor Finishing Techniques world famous modeler and editor of Tamiya Model Magazine International Marcus Nicholls shows us many of his award-winning techniques including paint chipping and bruising, German Panzer grey coloring, rust, dust, track finishing, the ‘hairspray technique’ and much more. A highly detailed menu lists each topic for quick and easy navigation whilst the DVD pause facility allows you to stop the action at any time to appreciate in close detail each step and the finished astonishing models. 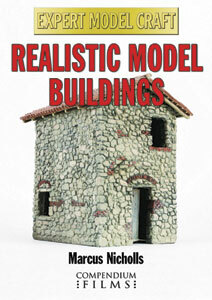 Marcus Nicholls is one of the world’s great modelers and specializes in detailing, painting and finishing techniques. For thousands of years whenever man has gone to war the horse has been there with him. From the fearsome horseback raiders of the ancient world through chariot warfare, fighting knights and cavalry to the slaughter of gun horses in World War 1 and the transport of ammunition and equipment in WW2, the horse has played a major role in human conflict. And yet the horse is under-represented in military modeling because of the difficulty of creating truly realistic effects. In Warhorses Max Longhurst dispels the mystery of converting and painting horses and demonstrates many of the techniques that have made him a renowned award-winning modeler. He shows in detail his conversion techniques, different horse colors and poses, choice of paint colors, undercoating and shading, sponge painting, dappling and final painting and detailing. Many aviation modelers struggle to achieve true realism in some of the finer details of aircraft modeling and they will appreciate some sound advice from a master modeler. Geoff Illsley, multi-award winning modeler and Chief Judge of the prestigious Euro-Militaire show, is famous for his airbrush painting skills but is also a dedicated and passionate aviation modeler. In this program he takes a look at some of the most difficult aspects of modeling WW11 aircraft and demonstrates in detail his techniques for finishing spinners, wheels, decals, natural metal effects and Luftwaffe colours. He also discusses the choice and mixing of paints, shows us the colour shift scale effect and much more. With our detailed menu and index it is possible to find all of Geoff’s impressive techniques at the touch of a button and the pause facility allows you to stop and savour the truly realistic results that he achieves.